Today is a day of celebration in America of giving thanks to the Lord for His blessings. However, there has been much unrest in our country over the past several days and perhaps many people touched by the events will find it hard to give thanks today. Maybe you weren't affected by those events, but perhaps other events in your life have caused a pause about being thankful. I want to suggest that perhaps being thankful isn't as much about circumstances as it is about the heart. Peace cannot come from external sources. When it does, it is flighty at best and structurally unsound. Peace can only come from One source, Jesus. Thanksgiving isn't just about giving thanks one day a year. It is a lifestyle derived from a heart soaked in thankfulness for the daily blessings that abound. It is all a matter of perspective. What we magnify will become bigger in our lives. We can choose to see the blessings or we can choose to see the bleak. We can choose to magnify the Lord and His goodness or we can choose to dwell on our disappointments. Think about a magnifying glass. A magnifying glass doesn’t make the object bigger. To magnify God doesn’t make God bigger. He is already BIG. The magnifying glass only brings the object more into focus and your focus on the object is increased. Our perception is what changes. We have the choice to magnify our problem or our God. We can magnify God with thanksgiving. Prayer and praise can change our perspective. I know life can be hard. I have seen my fair share of disappointments, challenges, and heart ache. I am in no way diminishing yours. My aim is to only point out that when we allow our worries and wallow to overshadow our worship of our Lord, we are only hurting ourselves. Thanksgiving (Giving Thanks) for all the blessings we have is part of the equation to inner peace. Think of the ripple effect it would have if everyone's heart was full of praise and thankfulness. Not only will our prayer and praise give us peace, it will also bring peace to others. God will use us to help set others free and bring His message of peace to them as well. Praying you have a wonderful Thanksgiving holiday and for your hearts to be full of thanksgiving not only today, but throughout the year. Praying that whatever you are facing, that you would see that the Lord is bigger and He is worthy of praise. He loves you. He is for you. He is with you. We praise You Lord for your goodness! One of the things I love about my phone camera is the ability to zoom in or out with only a move of my finger. All it takes is a flick of my hand to change my focus. What if we were able to zoom out and see our lives from God's perspective? What if we truly believed He is involved in every picture of our lives? What if we allowed His hand to change our zoom and refocus our vision? What if we zoomed out? This year our family endeavored into the adventure of homeschooling. Yesterday, we watched a video to learn more about Squanto, the Native American who helped the pilgrims learn to plant and survive in the New World. I never knew Squanto's life resembled Joseph in the Bible until yesterday. In summary, Squanto grew up as a child in America (before it was America). He was taken captive one day by Spaniards, and sold into slavery in Spain. Monks purchased him, not to be a slave, but to care for him. They taught him about God and he learned English. The monks knew he wanted to return home and eventually everything lined up for him to return home. However, when he arrived, his village wasn't there. He learned that everyone in his village had died from illness. He lived in the forest alone with the Lord until the pilgrims came to Plymouth Rock. He was able to help the pilgrims because of his time overseas and learning English while there. What man had meant for evil, God intended for good (Genesis 50:19). Amazing. If we took just one snapshot of Squanto's life and saw only that he was taken captive or only saw that he was sold as a slave, we might miss the bigger picture of God's greater purpose. Back to my camera, if I zoom too far in, I can't see the bigger picture. It appears blurry, muddled, and without purpose. Zooming out allows me to see things more clearly. We are but a tiny dot. We can trust our loving God. His hand never fails. What may look like a blurry, muddled mess may actually be part of a bigger picture unseen. We can trust our God with our blurry, muddled mess. We might not be able to understand, but we can trust His hand. Dear Lord, show us Your perspective and Your vision. Loving Father, we ask for You to refocus our minds and our hearts to You and what You are doing even in the middle of the messiness of life. Lord, we give You thanks for Your love and Your hand in our lives. In Jesus' Name, Amen. The wind began to swirl stronger as we loaded up the pearl white mini-van. My husband eyed his phone for the forecast. The kids were filled with excitement as they tried to maintain composure waiting for us to leave. Today was the pool party my daughter had been anticipating all week. At this party, she would receive ribbons for swim team plus have cake, pizza and a great time swimming! Sounds great, doesn't it? Bags were packed, family was in the van, husband phone in hand. Before backing up the van, he says, "There is a tornado watch. Let me call the pool and see if they are still having the party." We wait. He calls. The person on the other end says they are still having the party and people are down by the pool. Then there was a pause. She clarifies that everyone is out of the pool due to the pool being closed down temporarily. She wasn't sure why or when they would be getting back in the water. My husband conveys the news to me and we reluctantly decide to continue with our plan to go to the pool party. We backed up out of the driveway and headed down the street. As the wind ripped through the trees, my husband began to question our decision. 1. It is really windy. 2. There is a tornado watch. 3. The pool is temporarily closed. 4. The wind is picking up and the sky is getting dark. All note worthy reasons to not go to a pool party. ...and then there was the red balloon. As we drove down the street, we saw a red balloon...It was a random red balloon stuck in a neighbor's tree! It caught both of our attention. He then says, "And there is a red balloon in that tree!" Laughing, he decides, "I think the Lord is trying to tell us we shouldn't go!" Please don't misunderstand. We are not signs kind of people. However, sometimes if there are many obvious events or circumstances pointing to going one direction or another, we do need to learn to discern that the Lord may be trying to give us a message! We shouldn't just ignore if there are many obstacles in our way. The Lord may be trying to protect us and we need to listen. After seeing the red balloon and laughing, we happily turned around. The wind continued to pick up. That night, there ended up being a tornado warning and tornadoes touching down in the area. If we hadn't listened to the Lord's direction, we could have ended up stuck in the YMCA basement all night or worse. 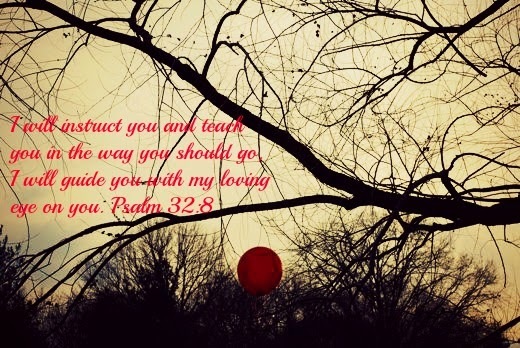 Sometimes those "red balloons" are the red flags the Lord will use to get our attention. The next time you are uncertain about a decision, look for those "red balloons". They might be just the thing the Lord is using to guide you into His blessings and away from the winds of harm. Are You a Big Toe? My twelve year old son, Joe, and I have been training for a 5K. About ten days before the race, a very large eighteen year old landed on his left big toe. Immediately he cried out in pain and the pain continued. His toe did not look great. It looked as if it could be broken. It was swollen, red and bruised. He was able to move it, so we concluded it was just badly bruised. A week later, his toe was still a little bruised, but the swelling had decreased and the redness had dissipated. We decided to try to go for a run. About a half mile into the run, he noticed his toe hurting. He said, "I never knew how something so small could effect me so much." I found this as a perfect opportunity to relate his big toe to our life in the body of Christ. "A big toe may seem small, but it becomes big when its brokenness hinders something you really want to accomplish. In the body of Christ, we are all a part of the body. Some of us are arms. Some of us are legs or hands. And some of us are big toes. As a big toe, we may not feel important. We might not think what we have to contribute really matters, but it all matters. When the body is missing the big toe or the big toe cannot contribute appropriately, the whole body suffers. We need the big toe! Every member of the body is important." I want to encourage you today that YOU are important in the body of Christ, even if you feel like you are just a big toe. Nothing is "just" a something in the body of Christ. Every member of the body is necessary to finish the race. Joe and I did finish our race this past weekend, bruised toe and all. His bruised toe didn't keep Him from finishing. The same is true in our Kingdom race. When we are all working together, with all the gifts God has given us, we can accomplish so much! If you feel bruised, that doesn't mean you have to sit out of the race. God never said all the members would be in perfect working order, He only says we work perfectly together. As a matter of fact, He says "those members of the body which seem to be weaker are necessary"! So, if you have days when you feel like a sore "toe", remember, He says, "You are necessary!" And the truest thing about anything is what God says about it.